This was going to be a VERY special event for me and BumbleB. This would be our first full on attempt at doing 100 miles on a single event. 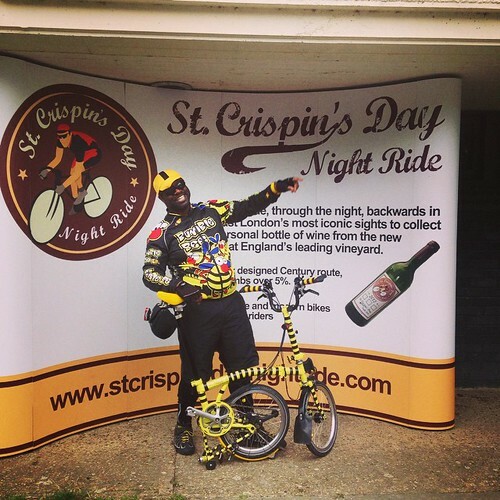 The St. Crispin's Day Night Ride wanted to create a ride that had all the quirkiness of England. 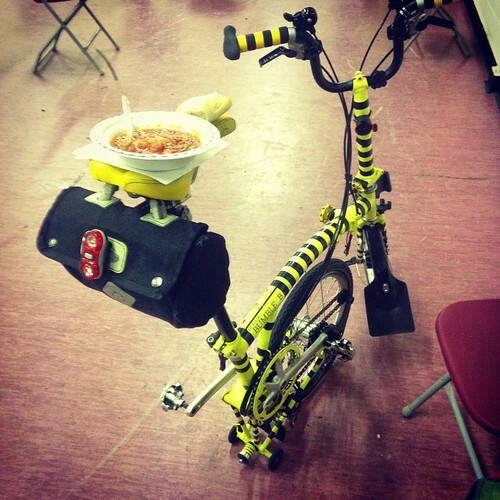 Obviously tradition, but then eccentricity, a challenge but one that was do-able by ordinary cyclists. We wanted a sense of endeavour and most of all we wanted to create the fellowship of shared experience. Well it definitely was an experience and one that we will treasure for a long time. I chose this event as it was billed as relativity flat, no hills to speak off which suited me just fine. 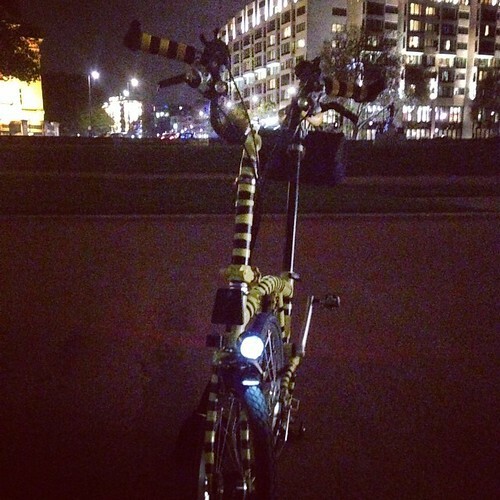 As always we was meeting up with my partner in crime Mr. OrangeBrompton at one of our favourite meeting places, Wellington Arch at Hyde Park Corner. We was a little nervous but knew once we was in the company of my cycling partner and friends those worries would fade away. A few things jumped into my mind while we was waiting. "Would I make it till the end?" "Would I have a puncture in the middle of no where?" and a million other thoughts jumped into my head. As quickly as they jumped in I pushed them aside saying that we was prepared for anything that would come our way. BRING IT! 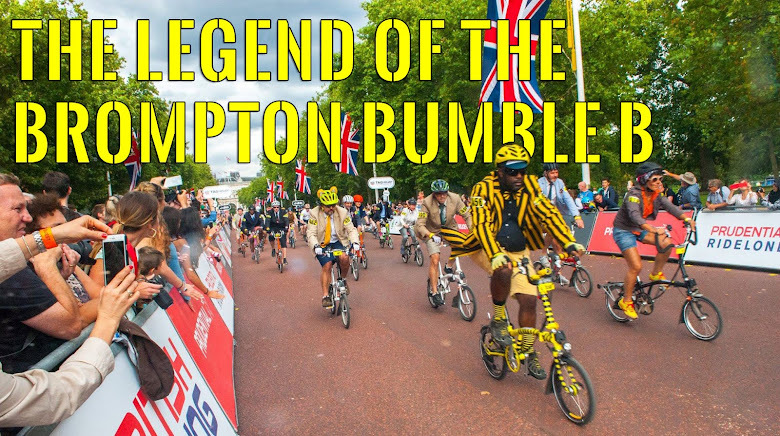 After awhile we saw Mr. OrangeBrompton heading our way. A good shake of the hand and we knew it was going to be a night to remember. We met up with a few other cycling buddies and headed down to the start point at Chiswick Boathouse. I have to say when we arrived I didn't really see that much it was pretty dark but with flood lights pointing at the main check in area. 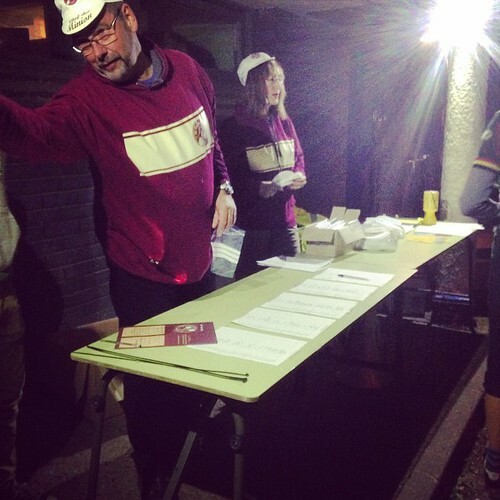 ALL riders where checked in and handed their "passport" and cycling cap. Given instructions on what the signs looked like on the road and told if about the information in the passport regarding break downs, emergencies on route. Very well organized, better than some other events that you have to pay ALOT more for. 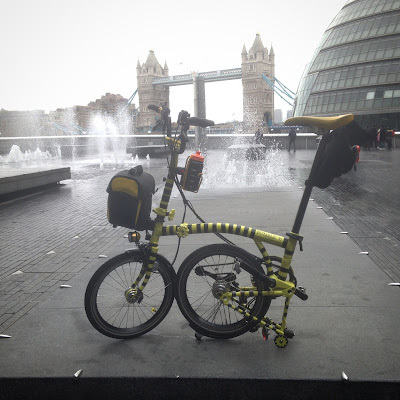 There was a ALOT more Bromptons on this ride as I was told last year there was just a couple so the London Brompton Club put the word out and my fellow Bromptoneers heard the call and we basically invaded. As always someone managed to make a batch of yummy flapjacks, this time it was Ann M's turn and I have to say it tasted yummy when I had mine in the middle of nowhere at silly o'clock. As the clock hit midnight we started to move. Dozens of cyclist all "clicking" into their SPD's is always an amazing sound to me, with so many clicking in all at once I knew it was the start of something legendary. This was the start of me and BBB's journey for our first "Century Ride" something that we promised ourselves at the start of 2014. There was nothing more to say but click in and DO IT! At first the LBC tried to stick together for the most part, making sure everyone got though junctions etc but with all rides everyone is doing it at a different pace. I tried to keep up with David P, Ann M and my buddy OrangeBrompton but after about 25-30 miles the crazy pace was just too much for me & I knew I still had another 70 odd miles to go yet so I started to pace myself according. 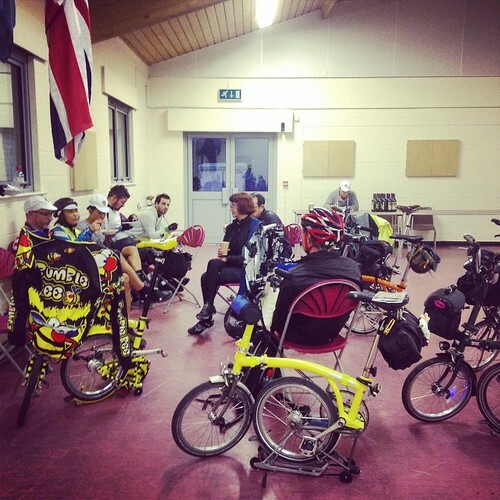 After getting out of London the group really thinned out as I knew it would and I found myself cycling pretty much on my own. In the past this would have bothered me greatly but I focused on the task at hand, the rhythm of my pedalling and breathing pushing out the negative thoughts that started to form. Luckily I had made sure I downloaded the course to my Garmin and with a combination of this and the event signs I managed to keep on course. I can't even remember much before the first pitstop as I was focusing so hard on making sure my breathing and cadence was comfortable but eating up the miles. I even set an alert on my garmin every 25miles so I would make sure I would snack and take water. The weather was perfect for this ride, not to hot and not to cold just right to have 2 maybe 3 layers on at most and my cycling under shirt, Bumble B long sleeve jersey served me perfectly. Not once did I feel cold even when we started to head out of the city and into the dark countryside where the temperature would drop a few more degrees compared to the city. I can't remember how far the first pitstop was but I was hunting it down as I heard there would be cake. For all those that know me I LOVE cake, I know it can be a bad thing but for cycling its not so bad as you burn it off. For this century ride I would be needing ALOT of CAKE. Arriving at Halliford Mere Lakes and Pavilion we could feel the warmth of the hot beverages & the sweetness of the cakes in the air. We had arrived at heaven. Our hosts where very supportive of all us crazy cyclists and ofcourse as soon as they saw me and BumbleB made them smile even more. 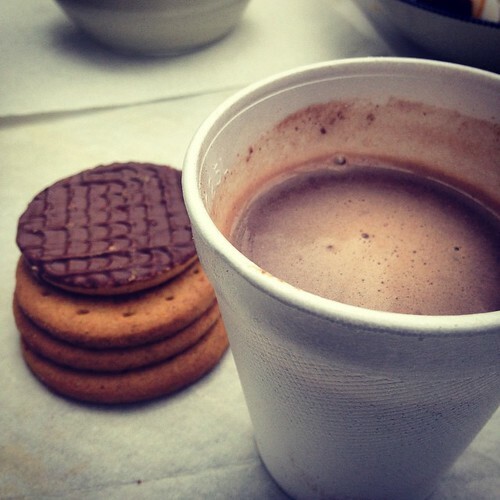 After a lovely hot chocolate, cake and refill of my hydration pack we was off again. We didn't want to stay to long as we still had quiet a away to go. Now it was onwards to where we would be picking up out bottle of wine. This was a pretty lonely time for me. The dark country roads most of the time it was just me and BumbleB with the awesome SON Edeluxe II. I have to say after being in serious darkness I was glad I didn't have to worry about my batteries going. 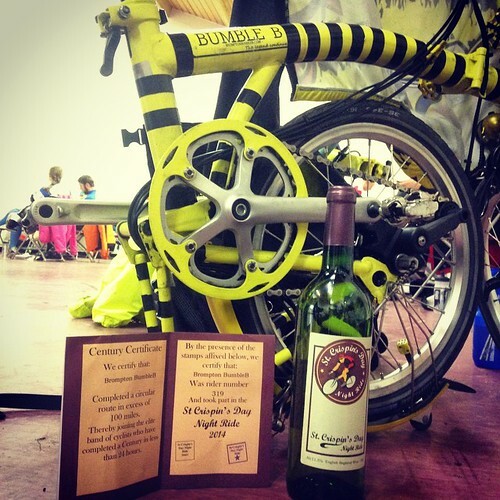 Every once in awhile other faster cyclists would pass me always giving me words of encouragement or saying they love BumbleB. A few times I was thinking, "What the hell am I doing out in the middle of nowhere?!" I would mentally slap myself & say your here because you want to be here, need to be here. To do 100 miles on a single ride. We got into a good cadence, breathing and taking on sips of water every 5-10mins. 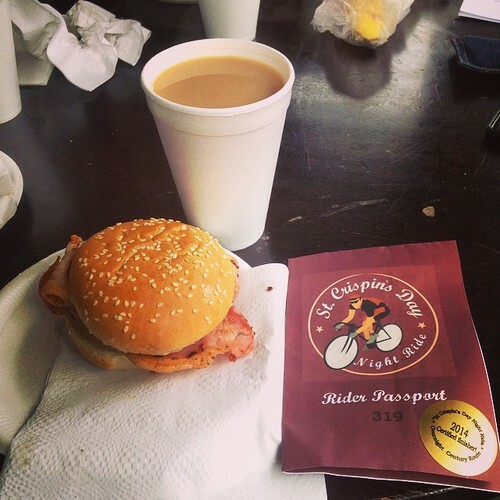 Every 10 miles or so I would have a bite of a flapjack or my guava jam sandwiches I had made. 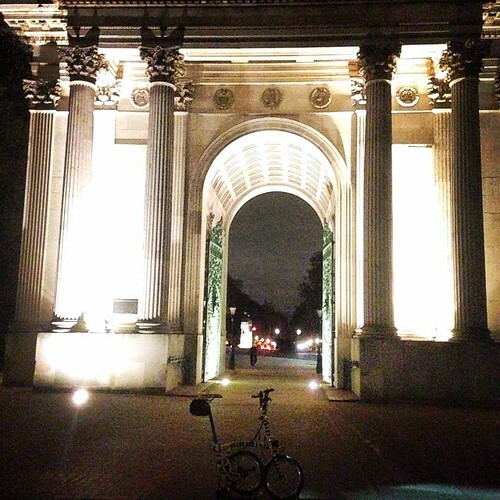 We saw light in the distance but it was just another fancy building with flood lighting, we kept going. I noticed that quiet alot of homes looked pretty experience as they all where gated and had touch key pads. I wondered if the people living there knew what was happening just outside there door that all these crazy cyclist riding past. At about 05:00 I received a txt from OrangeBrompton giving me words of encouragement along on my ride & I knew he had most probably got to the half way point. He knew how important it this ride was for me and had ever confidence that I would complete this ride without problems. There was a junction and I saw 2 signs, one was saying back to London. Surely we hadn't missed the point where we was to pick up the wine and hot food. I looked to my left and saw some cyclist a 200 yards away, they looked refreshed and I noticed bottles sticking out of their saddle bags and backpacks. We was close, VERY close. I looked to my right and down the road I saw someone in HiVis and a headlight. At 06:00 in the morning no one but a marshal for this ride would be out so we turned towards him as we got closer I could see a smile on his face. A welcome sight after 66 miles in the darkness, he said well done and pointed me towards where the main stop was. There was another marshal a little way down who also had a smile on her face. I knew that the "BumbleB effect" was in full force and was pointed towards a hall. 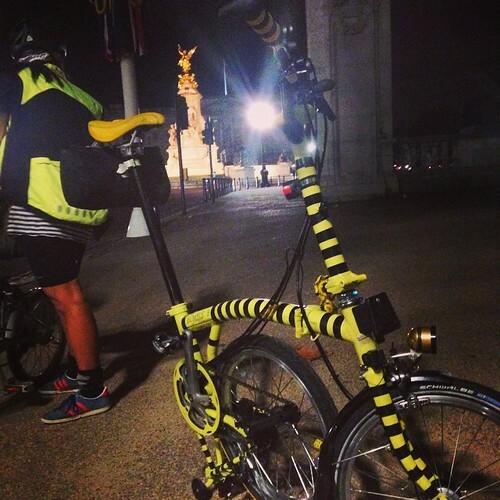 Outside we saw alot of big wheeled bikes but with a Brompton and especially BumbleB we was going inside. As we entered the "BumbleB" effect took hold as everyone turned to see us walking in, tired but in good spirits and ready for a little rest & hot food. I collected my bottle of wine and got my passport stamped & grabbed my stew. I had the chicken stew which I have to say was pretty damn good. I wolfed it down and felt the energy slowly returning. I remembered to keep stretching as best I could so my muscles didn't cramp up on me. My brain suddenly came to the realisation that we had broke my record. Our longest single ride to date was 64 miles back in 2012, we had beaten it by 2 miles but we still had to cycle back to the start to finish off our century. I knew we was in the home straight now and I was extremely happy. I was surprised to see David P still here but he was waiting for Ann M as they got separated along the way. When Ann M did finally arrived she had got a little lost but found her way back. Thankfully Ann M & David P let me tag along with that on the return journey, a mere 44 miles. Just before we was heading out a few more of the LBC clan arrived, looking tired but glad to have made it this far and ready for the return journey after break and food. I couldn't stay as I would have started to seize up. I was warned there was a few smallest hills on the return but we wasn't as bothered as I knew we was heading back to finish this ride. We stopped a few times on some of the hills but I'm finding that I'm doing it less and less each ride. Anne and David did wait for me at times as they know me and hills don't agree. Returning to the Halliford Mere Lakes and Pavilion I knew we didn't have far to go, just another 14 miles. I looked at my Garmin and it was saying 88 miles, I never thought I would ever seen that in my life but it gave me a happy glow. Just as we was leaving to get back to the finish my garmin acted weird and turned itself off. I thought ok I stopped my ride so it should still be saved. Well when I did finally boot it back up I found that my 88 miles track had disappeared. I couldn't believe it. After all that I had no data of the ride. 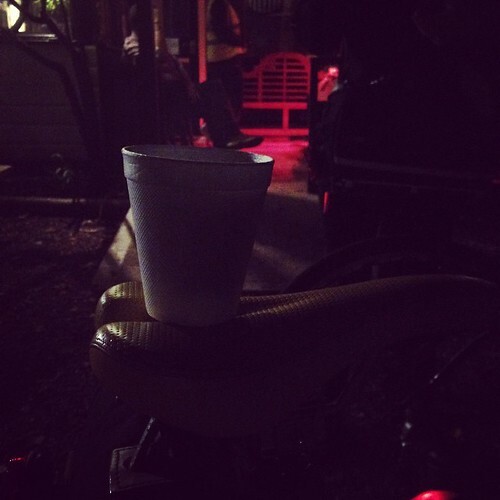 I calmed myself down and said to myself that it wasn't important as I knew we did the ride. I got my passport stamped & the wine so I definitely did it. Anne, David and me kept together for the final 14miles back to the Chiswick Boathouse. The legend has done OVER 100 miles on a single ride! I was feeling pretty damn good, everyone knew how big this was for me and it was smiles, congrats & hugs all over the place. Now it was time for some serious breakfast as I was seriously hungry. After eaten my bacon roll and hot tea I felt truly LEGENDARY. I want to thank everyone I rode with, my cycling partner in crime, Anne, David, & everyone else that was with me, passing me, being passed by me. Big thanks also go to the St. Crispin's Day Team for the organization for the whole event. Next year? HELL YEAH sign me up ! If you haven't done a (100 mile) century ride yet I can't recommend this one enough especially if you have problems with hills. Well done! I hope to be joining LBC doing the ride next year. That was one heck of an entry! Congratulations, and thanks for taking us along on the ride.